Rhode Island’s all-Democratic Congressional delegation is none-too-pleased with Trump’s tax plan that seems poised to reach his desk today or tomorrow. “Republicans just pulled off one of the biggest cons in the history of American politics,” said Congressman David Cicilline. Both chambers of Congress have approved the first major rewrite of the federal tax code since 1986; and it’s been noted that it’s the first time the tax code has ever been retooled on strict party line votes. Critics say corporations and the super rich got the best deals and any middle class tax relief sunsets in a number of election cycles, while proponents claim there will be trickle down benefits to the economy. Below are the full statements from Rhode Island’s Congressional delegation. 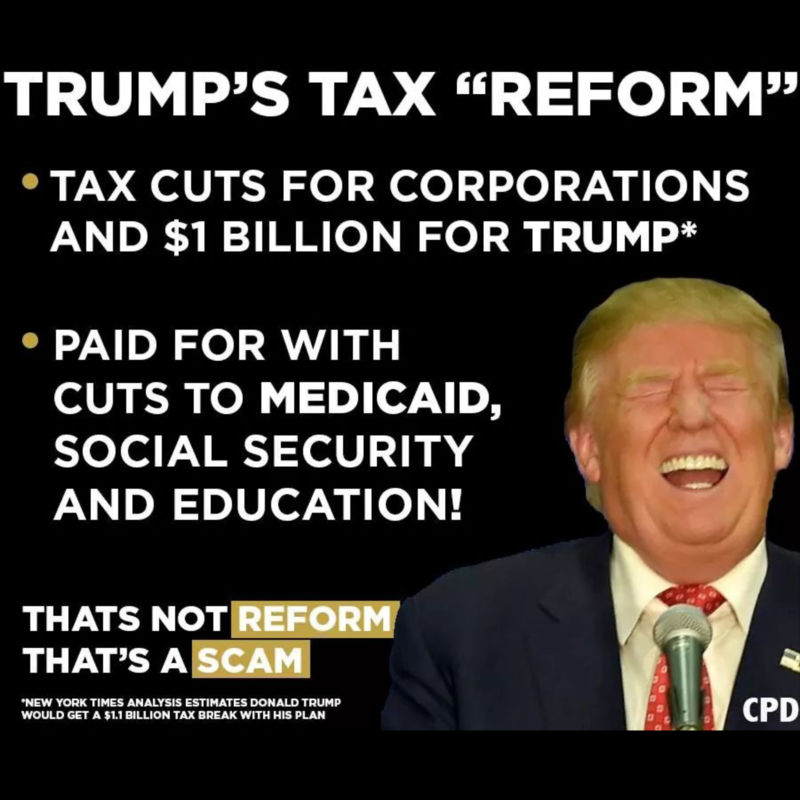 TrumpTax reads like a list of broken promises to the middle class. Instead of boosting the middle class, it limits popular deductions and threatens home values in Rhode Island and across the country. Instead of honoring the President’s commitment to protecting Medicare and Social Security, it sets the stage to slash them. Instead of making taxes simple enough for Americans to file on a postcard, it opens new loopholes and leaves the tax code every bit as complicated. TrumpTax even gives real estate developers a massive tax cut – just in time for Christmas at Trump Tower. Jamming through this tax plan is regrettable. The Republican tax bill is a giveaway to the wealthy that ignores the needs of the majority of Americans and will actually raise taxes on tens of millions households. I have long said that we need reform to make the tax system simpler and fairer in a fiscally responsible manner. This Republican tax bill fails on all accounts. It will explode the national deficit to the tune of $1.5 trillion over the next decade. It adds needless complexity to the tax code with enormous new loopholes. And, in the end, it will give 83 percent of its benefits to the wealthiest one percent of Americans. Most prominently, the top tax rate for the rich is reduced from 39.6 percent to 37 percent. Giving millionaires a break will not jumpstart our economy, nor will it help the hardworking middle-class Rhode Islanders who will be hit by new restrictions on their ability to fully write off their state and local taxes. The few crumbs that are offered to the working class all expire in a few short years in order to keep the cuts for corporations permanent. Big business is the other real winner in the bill. The permanent cut of the corporate rate comes at a time when businesses are sitting on record amounts of cash. Corporations don’t need a handout, they need a more efficient tax code. New rules for so-called pass-through entities will disproportionately benefit complex holding companies like those the President still owns. Gaming the pass-through system is just the first of what is sure to be a bonanza of loopholes Republicans either put in at the request of lobbyists or failed to close in their rush to get the bill passed. We will be paying for these failures for years to come in the form of higher deficits and investments in tax lawyers instead of workers. This bill is not only filled with bad tax policy. Despite having failed again and again to repeal the Affordable Care Act, Republicans are continuing their attempts to sabotage health care markets. According to the nonpartisan Congressional Budget Office, 13 million Americans will no longer have health insurance coverage as a result of this tax bill. It is unconscionable that Republicans would put the health of their constituents at risk in order to line the pockets of their friends, but that is exactly what this bill does. And, because it is not paid for, Republicans face an immediate Medicare crisis of their own making, with $25 billion in cuts now scheduled for next year. We cannot cut vital programs like Medicare and Social Security, yet that is exactly what Republicans intend to do as they try to deal with the trillion dollar hole in the deficit they’ve created. If Republicans were willing to prioritize tax cuts for the middle-class and Main Street businesses, we could have passed bipartisan tax reform to simplify the tax code and strengthen our economy. Instead, Republican leaders rushed this slap-dashed, partisan, trickle-down tax scheme through with a reckless disregard for facts and independent analysis. I oppose the Trump tax bill because it is unfair and irresponsible. It is an historic transfer of wealth from students, seniors, and working families to multi-national corporations and wealthy estates. It weakens America’s financial stability and undermines the integrity of our tax system, baking corporate tax avoidance into the system. Republicans added so many new loopholes that some wealthy individuals with armies of tax lawyers may escape taxation altogether. They also got rid of targeted tax deductions that middle-class Rhode Island families have relied upon. The Trump tax will adversely affect Rhode Islanders in so many ways. The temporary benefits some families may see won’t cover the long-term damage from this bill or offset the increased costs for things like child care, education, health care, and housing. Republicans currently control the House, Senate, and White House and are using their leverage to run up the federal debt and cut holes in the social safety net. They will soon demand cuts to Social Security and Medicare to reduce the deficit they just created. Rhode Islanders pay into Social Security and Medicare with every paycheck they earn, and I will strongly oppose any effort to take away or lessen their retirement security. Instead of simplifying the tax code, the Trump tax bill opens more loopholes than it closes. Instead of prioritizing tax relief for the middle-class and small businesses, it lines the pockets of the powerful at the expense of working families. There is not a single, respected economist or tax scholar on the left or right who contends that this bill simplifies the tax code and pays for itself. Not one. President Trump and Congressional Republicans sold the American people a bad bill of goods. Now President Trump is trying to claim his short-term political victory is a win for everyday Americans, but they will see all the benefits going to his family and very few going to theirs. Republicans just pulled off one of the biggest cons in the history of American politics. This job-killing bill gives companies even more incentive to ship American jobs overseas. It lays the groundwork for devastating cuts to Medicare and Social Security. It robs working people in order to give even more money to the wealthy. And it will force the next generation to pay off more than $1 trillion in new deficit spending. The American people are going to see through this scam. Working men and women deserve real tax reform that begins with a tax cut for middle class families and promotes the creation of good-paying jobs. That’s what Democrats will deliver when we control the House again. Bob Plain is the editor/publisher of Rhode Island's Future. Previously, he's worked as a reporter for several different news organizations both in Rhode Island and across the country.